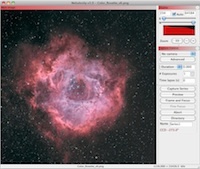 Nebulosity is designed to be a powerful, but simple to use capture and processing application for Windows (7/8/10 32/64 bit) and OS X (10.7-14). A huge array of cameras are supported for capture (see below) and images from just about anything can be processed (support for many FITS formats, PNG, TIFF, JPEG, DSLR RAW files, etc). Its goal is to suit people ranging from the novice imager who wants to create his or her first images to the advanced imager who wants a convenient, flexible capture application for use in the field. In it, you get a host of purpose-built, powerful tools to make the most out of your images and imaging sessions. Nebulosity 4 (currently version 4.3) is $95. Existing v4 users can download the current full-release or any pre-releases free of any cost (your v4 license is good for all v4 updates). Users with a valid version 3 license or users with a valid version 2 license can upgrade to a version 4 license for $20 and $40 respectively. Canon DIGIC II* / III / 4 / 5 (etc) EOS DSLRs. If you're ready to purchase Nebulosity, version 4 is $95. Before you do though, download it and try it out in demo mode. This will let you see how it works and test it out with your hardware (refunds cannot be readily given for basic functionality issues that can be readily tested in the demo). When you're really ready, purchase of the license code entitles you to free upgrades within that version (e.g., a 4.3 license will get you free upgrades to any 4.x product). Simply download the current version, submit your payment via the PayPal icon below (you do not need a PayPal account - credit cards without PayPal accounts are just fine). The license code will be automatically e-mailed to you (please check the e-mail account associated with your PayPal account (or entered in at time of purchase) and ensure that the e-mail was not labeled as SPAM. The code should arrive within minutes). Nebulosity is a cross-platform application. It runs natively in Windows (Win7-32/64, 8, 10) and in OS X 10.7-10.14 (Intel only - Version 2 supported PPC processors - Version 3.0.7 was the last to support OS X 10.5). While Nebulosity itself is fully cross-platform, many of the camera drivers required for image capture are not. Under OS X, camera control and image capture is supported for a limited set of cameras (see above). Likewise, some cameras (e.g., older Canon DIGIC II DSLRs) are not supported by Canon under Windows 7+. All processing features are currently supported and license codes purchased for the Windows version of Nebulosity will unlock the OS X version as well. You are free to download both Windows and OS X versions and use the same code for each. People looking at software for astrophotography have a wide range of options, these days. So, you might ask, why Nebulosity? Nebulosity takes a different approach than many packages. You’ve got a number out there that are trying to be the be-all and end-all package that controls everything from your camera to your dome to your toaster. As a result, they’re often very large (and therefore tougher to navigate), and very expensive. In general, this doesn’t make for something well-suited to someone just getting going in this hobby. In addition though, much of what you get in larger packages isn’t used by some of those doing the best work out there. You’ll find top imagers that use their astro package to control the camera, get the images, pre-process and stack them, and they’ll then shift entirely (or nearly so) over to something like Photoshop or PixInsight. With Nebulosity, you can do all that for a fraction of the cost and with a far simpler user interface. This simpler interface has led many advanced users to abandon other packages and use Nebulosity in the field and for at least their initial processing. Why? Try it and find out! The demo is free and lets you try out all the features. For a full run-down, have a look at the feature list in the full manual or simply download it and try it out (Download page). All features are enabled when you download it as a demo, but saved images will be degraded (diagonal lines superimposed) until you purchase a license. Thus, you can evaluate the software extensively prior to purchase. Keep in mind, all changes are described in the Release Notes and often Pre-release versions are available with new features.